holko, Qw3rtzuiop and 5 Guests are viewing this topic. LeCroy 9310C DSO--Free from dumpster. Has an issue with Ch1 input attenuator, but doesn't appear too serious. Back in the early days of eBay I won an auction for a Tek 7704 for a good but not great price. When I received it I found that the auction listing wasn't accurate. They hadn't bothered to mention the box of 2 dozen probes that came with it. Just those probes were worth my winning bid for the 7704. Wow! Was there an electronics shop that used the dumpster? Just got one yesterday, a N2863A oscilloscope probe (300MHz), used, but in nice conditions, by US$ 21,00 (today rates). Since it is not so easy to find on used market here, and the value, I'm very happy with this 'score'. Not sure how much of a score yet, but I got an HP E3615A DC 0-20 V, 0-3 A, 60 W Power Supply for $75 including shipping. Unit powers on but no further tests was done and sold as is, it does have the back connector to link to other supplies but I only went for one. Negative binding post is red??? and ground binding post is black??? I'll swap the negative and ground and search for a green binding post to replace the red one or just paint it or something. Now to wait if it gets delivered in the same condition as pictured. I think HP had a problem with the binding posts breaking on some of the E-series supplies. I got a 0-120v model for a song a few years ago and found that the negative post had cracked behind the panel. A little epoxy and it works like new. Maybe the former owner of your supply had some spare off-color posts laying around? That's the way HP made them at first. Around the time they turned into Agilent there was a minor cosmetic refresh and one of the changes was switching to the red/black/green binding posts. Classic, I bought one of the others (there were three for sale). I'll be interested to see if it works, but I'm not really worried, looking at the description they should be at least an easy repair. I've got a couple of other HP supplies (6205C, 6237A), and they've got the same scheme, all red except for earth. They seem to have changed to red / green / black only a little before becoming Agilent. And that's why I didn't post anything about the auctions in here or I wouldn't have a chance in hell. I did let go the first one, I could have outbid it easily but decided to get the first bidder out of the way plus one of the standoffs had the ring broken and they got it for $4 less of what I got for mine. and the 2nd bidder on mine tried for the third one but someone (you probably) got it for just $1.00 over. Unless you are the one that got the first one, but even with the post ring missing it shouldn't be a problem on that 1st one. Snapped up an Advantest R6581 for $500 a while back, it's an 8.5digit multimeter. Think of it like a baby 3458A, 2-3 times worse on linearity (0.1ppm) and noise(0.025ppm RMS), but it does have artefact calibration and hey, I can't really complain because of the price. I dig the dual line display, it's very easy to use. 5ppm per year accuracy on DC volts, and a tempco of 0.15ppm with autocal. The seller described it as broken, because on power-up there was no reading shown, and the relays were clicking non-stop rapidly, hence listing it for so cheap. This meter always self tests on power on, and the seller's photo did not show any error annunciators. Upon arrival, yep, it's as the seller described. I ran the internal calibration (which is like the AutoCal on HP), and hey, it all seems to work just fine until I power cycled the meter. It then showed error -315 "configuration memory lost". 10 bucks and 2 solder joints later, she works a treat. It's a standard 1/2AA 3.6V battery, axial lead with 1.25inch spacing. Access to the battery is easy, just remove a couple of cables in the way, there's no need to take off any shielding. The local cal lab said it was 9ppm off on 10V DC, and was adjusted to be 0.3ppm off. There weren't any stickers on the unit I have so who knows when it was last calibrated. I don't have the cash for a proper calibration with a Josephson-Junction ($1.8k+), so I'll have to live with their stated 2.4ppm uncertainty. They did have their 10V reference freshly calibrated, hopefully it's a bit better than that in practice. My unit was made in Feb 1998 according to the battery, and there must be other units running out of batteries, so I hope by posting this you guys can snag a good deal too! Especially I'm interested, how the autocal and in conjunction the basic calibration of the R6581 works, i.e. if also 2 artefacts (10V, 10kOhm) are necessary only. Yup, it is also 2 source 10V and 10kOhm artefact calibration, same as 3458A. It has something called "Internal Calibration", I suspect that it is just their version of AutoCal as the spec sheets indicate that it's for the tempco compensation. You can perform the INT CAL separately for DCV, Ohms and AC, just like AutoCal. The difference between the R6581 and the R6581T/D is that the latter only has DC and Ohms functionality, and with limited range on DC, like 100V DC range maximum. I really don't want risk messing with the R6581 calibration until I acquire a stable voltage and resistance reference, so I don't think I can teardown the unit just yet, sorry! It will happen eventually though, I'm sure! That is definetly a cool meter. If/when you do tear it down, what are the jfets that it uses. Not as good as some but I gotta working Hameg 605 for $100 delivered. And a Fluke 8842A for $130. I was very impolite.. sorry..
"Congratulations on that great instrument!!" The bbs38hot site, lyemx himself, answered many of my questions, and even the Japanese manual (Geez, 680 pages w/o schematics) also revealed enough information about the specs. No need to make a further teardown. Well, they also made a much better use of the LTZ1000 (non A) reference, at 65°C only, compared to the 3458A.. and intensive use of bulk metal foil resistors, like in the Fluke 8508A. PREMA also made an 8 1/2 digit DMM, based on their A/D technology, but I dunno which A/D they used inside. One of my best scores, from about ten years ago. The Wayne-Kerr B221 admittance bridge measures capacitance in parallel with conductance at 1591 Hz (10,000 rad/sec). The bridge is based on ratio transformers. So long as the number of turns does not change (integers are the only exact things in life), the accuracy depends on the internal standards, which are hermetically sealed. Front-panel switching allows measurement of negative capacitance (inductance) as well as negative conductance, using the transformers. Checking against lab standard capacitors, no tweaking of the calibration was required (roughly 50 years after manufacture). The only repair required was replacing the line cord, which had been somewhat butchered by the previous owner when switching from UK-style to NEMA plug. I have purchased replacement vacuum tubes, but have not needed to replace any yet. The best thing about this unit is the bridge null indicator: two cascaded dual magic-eye tubes. They "close" in sequence as the signal approaches zero, with no meter lag. 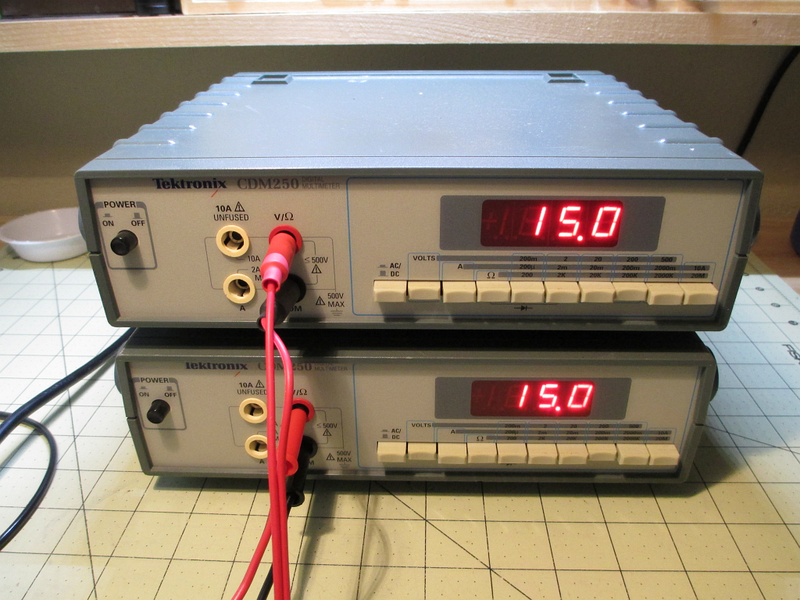 Just received from an Ebay auction - not one but two Tektronix CDM250 DMMs for the low low price of $10.75 total. Listed as "For parts or not working". As far as I can tell they work perfectly. A few weeks ago a TTi TSX 1820P 18V x 20A programmable power supply with GPIB for $145.00, Fluke 8842A with 09 AC board for $100.00, AMREL PPS-1322 30V x 2A programmable supply for $50.00 In late January early February a Keithley 175A multimeter for $100.00, Tek 2235 scope for $120.00, Philips PM 6676 1.5 GHz counter for $199.00, Leader LDC 823A 225 MHz counter for under $100.00. All items working, the TTi supply looks to be almost new so do the counters. All working just fine so far as I can tell. So my HP E3615A DC 0-20 V, 0-3 A, 60 W Power Supply arrived today and I powered it up since the auction showed that it powers on. Tested the over voltage by setting it to just 12V and it works. Tested the CC and it works fine as well. Grounded the negative post so I could hook the PS to my scope. It does has a 5 Vpp short pulse at power up, then it has another shorter one when the power supply finally engages 60 ms later (a bit longer for the upper voltage range) these transients are very short lived, and the supply reaches the voltage around 50 ms later. Here is the power up with the supply set to 20 V, the first arrow is when I throw in the switch, the 2nd is when the supply starts supplying. At 3 V, it's almost overshooting when it actually starts, but the power on goes up to 5 V for a 8 Vpp short burst that goes into the negative as well. Last, when set to 0.5 V, the overshoot is very pronounced, but very short lived. But it's just a bit under 1%. I'm happy with it, I hope amc184 had a good deal as well with his. Should I worry about the powerup spikes? @miguelvp Interesting re the power-on spike, I had one that was tripping the OV on a used 6644, the spike was only 8uS long but was 80V! The real problem with the 66xx etc series is they almost all use the SAME board FFS!!!!!! So half the component slots are not populated !!!!! and to make matters worse HP (God bless them) also skimped on the schematics, the schematics would cross two or three models, so the only way to know what was supposed to be there was the parts list, this was also clearly wrong as I had MOSFETs and the parts list had BPT!!!! Long story short, someone had taken out a final filter cap and covered there tracks well!!! Aaaaarrrrgggghhh. I wonder if you may be picking up other spikes via ground or radiative interference, but check the output caps for me please! I tend to agree. Leave the output completely floating, and use coax directly to the scope. Don't create that ground loop by grounding the supply output. Also to the OP, the meters are easy to adjust with multi turn pots on the display board. Yours seem pretty consistently 1% or so high. I grounded the negative post to the earth ground post, the manual states that either the positive or the negative can be grounded. If I measure the voltage from the earthed negative with the scope ground (earthed as well) I get no voltage as expected. I didn't want to ground the negative post with the scope ground to avoid transients. Yes, the multi turn pots are nice and yeah I know I can adjust them, I was showing the voltages displayed vs output just for information, i'm not concerned about that at all. I'll try to capture the transients at a lower time scale when I get back home.